I’m on an orange kick lately – I just bought these Ray-Ban mirrored sunnies and now I’m thinking I need these glam earrings by Anton Heunis! I have this Maslin zebra towel in grey but think the orange is pretty spectacular too. Don’t forget that today is the last day of the Shopbop sale! Enter code SPRINGEVENT at checkout and save up to $300 on your purchase! Click here to shop. 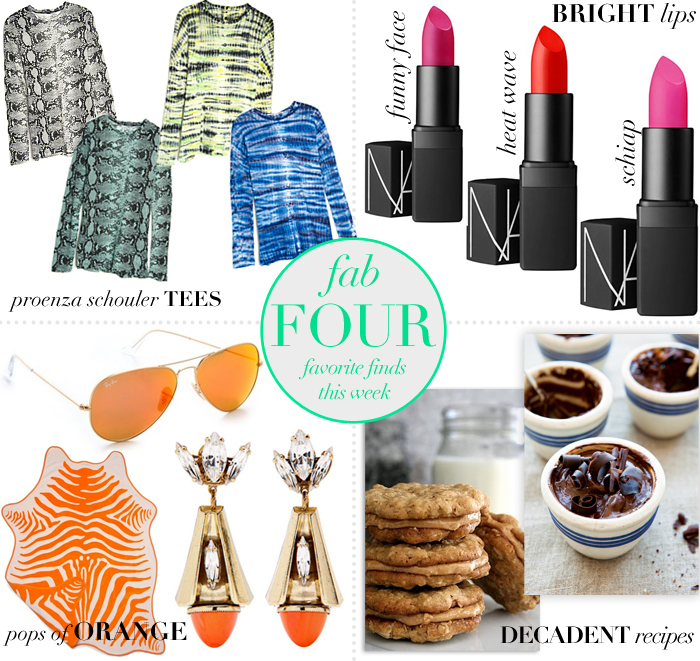 I’ve had my eye on those Proenza shirts too – they’re perfect for the digital print trend going around. It’s just so hard to commit that much money to a t-shirt though. I keep thinking of that Macklemore song! I am loving orange too! That rug is awesome!! I like the yellow tie dye and the green snakeskin best. Looking forward to seeing which one you pick!